If the resistance is constant over a considerable range of voltage, then Ohm's law, I = V/R, can be used to predict the behavior of the material. Although the definition above involves DC current and voltage, the same definition holds for the AC application of resistors. Whether or not a material obeys Ohm's law, its resistance can be described in terms of its bulk resistivity. The resistivity, and thus the resistance, is temperature dependent. Over sizable ranges of temperature, this temperature dependence can be predicted from a temperature coefficient of resistance. The factor in the resistance which takes into account the nature of the material is the resistivity . Although it is temperature dependent, it can be used at a given temperature to calculate the resistance of a wire of given geometry. It should be noted that it is being presumed that the current is uniform across the cross-section of the wire, which is true only for Direct Current. For Alternating Current there is the phenomenon of "skin effect" in which the current density is maximum at the maximum radius of the wire and drops for smaller radii within the wire. At radio frequencies, this becomes a major factor in design because the outer part of a wire or cable carries most of the current. The inverse of resistivity is called conductivity. There are contexts where the use of conductivity is more convenient. 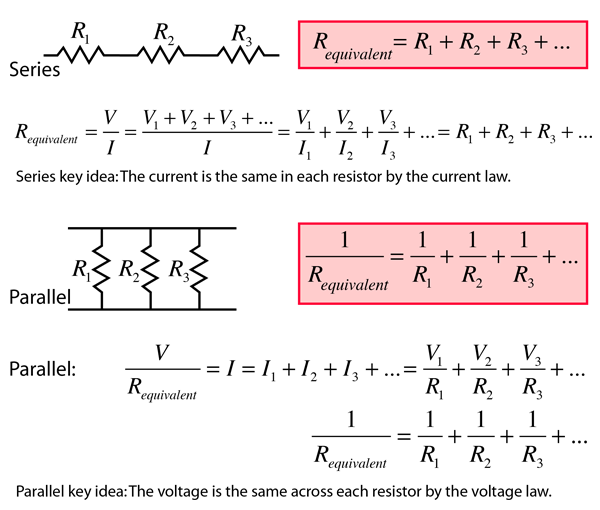 The combination rules for any number of resistors in series or parallel can be derived with the use of Ohm's Law, the voltage law, and the current law. will have resistance R = ohms. Enter data and then click on the quantity you wish to calculate in the active formula above. Unspecified parameters will default to values typical of 10 meters of #12 copper wire. Upon changes, the values will not be forced to be consistent until you click on the quantity you wish to calculate. in ohm-m(x 10-8) at 20°C. The factor in the resistance which takes into account the nature of the material is the resistivity. Although it is temperature dependent, it can be used at a given temperature to calculate the resistance of a wire of given geometry.